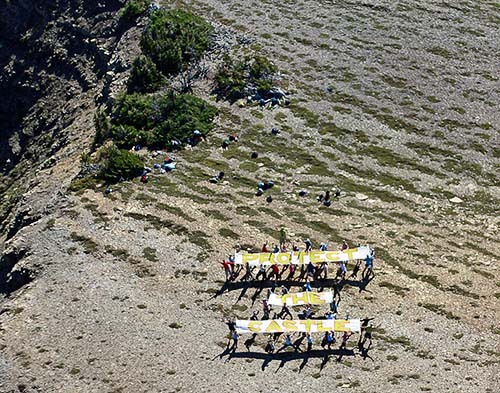 Even though it was early on a Sunday morning, the energy level was high as some 50 hikers set out a little after 8:00 a.m. on September 15 for the summit of Table Mountain high above Beaver Mines Lake in the Castle Special Place, southwest of Pincher Creek, Alberta. 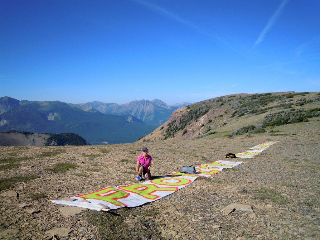 The hikers carried an 88-foot-long banner that read PROTECT THE CASTLE. They unfurled it once they reached the top of Table Mountain. 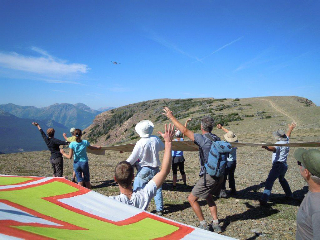 About noon a small aircraft appeared, and participants whooped and waved as the plane made multiple passes to record the scene. Despite being declared a Special Place in 1998, the Castle remains the only one of 81 Special Places that has not received its final legal designation as a protected area. In the intervening 15 years, recreational and industrial pressures in the Castle have increased, and the ecological health of the Castle has declined. 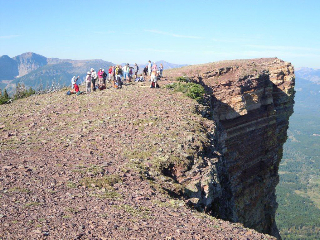 Recently, there have been vigorous public protests over Spray Lake Sawmills’ clear-cut logging in the recreational heart of the Castle, and in what is considered core grizzly bear habitat under the grizzly bear recovery plan. 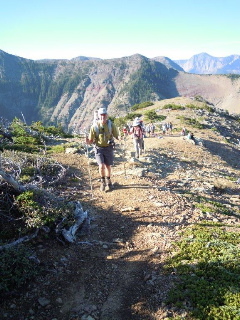 Spray Lake Sawmills’ clear-cuts were clearly visible from the summit of Table Mountain. This clear-cut logging, and the Castle’s declining ecological health, are of particular concern given the Castle’s status as a vital “water tower” for the Oldman River basin. 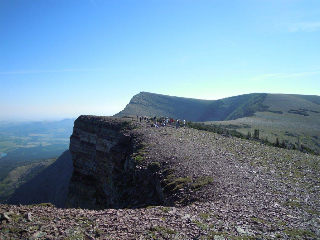 “We trust and expect that the Government of Alberta’s soon-to-be-released draft South Saskatchewan Regional Plan (SSRP) will recommend that the Castle be protected as a combination Wildland and Provincial Park”, added Gordon Petersen of the Castle-Crown Wilderness Coalition. 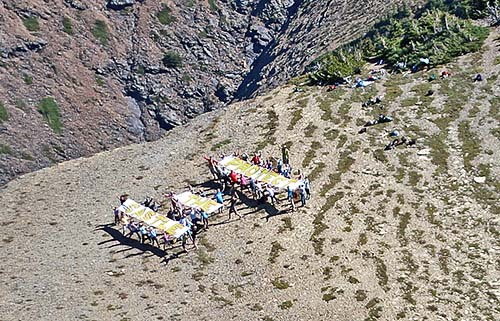 The Bert Riggall Environmental Foundation and the Castle-Crown Wilderness Coalition co-sponsored this event. 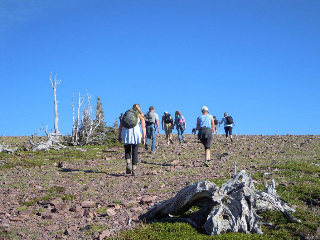 The Protect-the-Castle Hike is a Go! Starts tomorrow, Sunday, September 15, 8:00 am. A simple gesture to show the world that we want the Castle Protected. 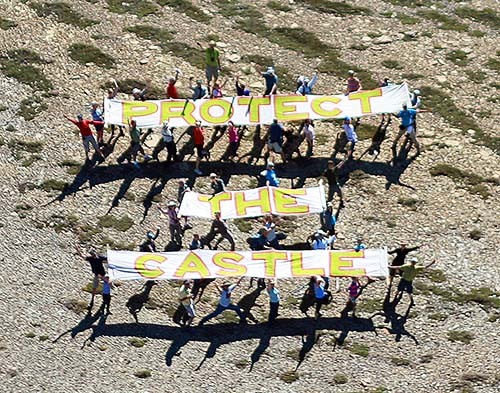 I propose you join us on September 15, 2013, for a hike to the top of Table Mountain where we will post the banners ” Protect…the.. Castle” on the top. Bob Pisco or his son will fly over with Jim Cameron and take pictures of this moment in time. Gordon Petersen will share it with the media and spread it around. 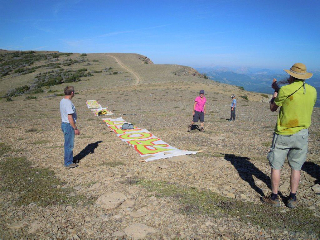 We need a minimum of 12 hikers to hold the edges of the canvas banners, but having more would be so great. 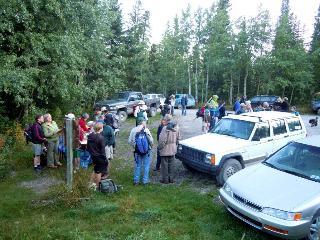 Join us at the trail head parking lot at Beaver Mines Lake Recreation Area at 8:00 a.m. on September the 15th, with lots of water, a packed lunch and the hearts of lions. The hike will take about 3 hours up and less coming down. 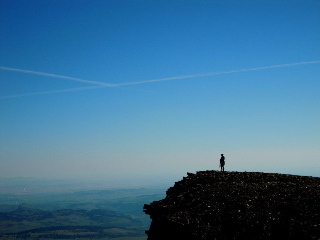 Looking forward to see you not only stand up for the Castle, but do it while standing on a mountain of the Castle. 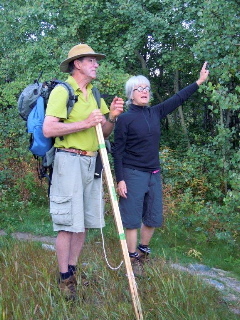 Organizers will check the weather forecast on Saturday, Sept 14 at 6:00 pm to decide whether or not the hike is a “go”. Check back here shortly after 6:00 for the latest update. By Lethbridge Herald Opinon on August 31, 2013. There is a special place called Hidden Creek in the headwaters of the Oldman River. Bull trout have migrated there to spawn for thousands of years. Native cutthroat trout, in precipitous decline elsewhere, also hang on in the stream by a fin. If there was a place where fish should have trumped logging, Hidden Creek is the place. It seems there is no place in our Eastern Slopes inviolate from logging. Hidden Creek was logged last winter in a rush, possibly to counter any objections to the contrary. The footprint of a few months of activity now will persist for the foreseeable future and put bull trout and cutthroat trout, both “threatened” species, in peril. Today’s commercial logging is brutal, mechanized, large scale and probably economically marginal. To make economic sense, the usual rules about land use are consistently watered down by the Forest Service as a service, perhaps a subsidy, to the timber industry. 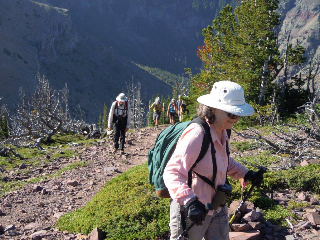 To accommodate logging of the steep, topographically challenging Hidden Creek valley, the Forest Service granted several significant deviations from accepted practice. The logging road was constructed well within the usual protective buffer, meaning sediment has a quicker, direct run into the stream. The valley seeps with water, like a sponge, and is the reason why bull trout home there to spawn. Many source water areas (tributary streams, springs and seeps) were logged over; where buffers were left, these were wafer thin and of questionable effectiveness. Roads and trails now channel both surface and groundwater flow in ways that enhance erosion. Reclamation of the logging footprint, termed “state of the art” by the Forest Service, is best described as minimalist and perfunctory. The stabilization of steep slopes is problematic and slumping may introduce sediment into Hidden Creek in catastrophic amounts. Attempts to contain sediment from bare slopes and keep it out of the water can charitably only be called cosmetic. The way industry logs, the way the Forest Service allows and directs industry to log, has soured the majority of southern Albertans on timber harvest. Numerous public opinion surveys corroborate this, including the responses of most participants in the South Saskatchewan Regional Planning process. A mad rush to log all the sensitive watersheds, the ones containing “threatened” native fish, is a cynical attempt to get the last tree before public opinion finally awakens and overwhelms the rapacious, short-term treatment of our headwater water towers. 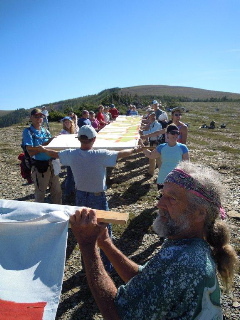 Laurence Peter, famous also for the Peter Principle, said, “Bureaucracy defends the status quo long past the time when the quo has lost its status.” So it is with the Forest Service that continues blindly to promote destructive logging practices long after the public has said other forest values are more important. Whether in the guise of local economic development, fire protection, a prophylactic for insect damage or the latest – “water harvest” – the Forest Service sticks to the consistent theme of “the answer is logging, what was the question?” Certainly one of the silliest, if not the most disingenuous of initiatives, given recent flooding is the Forest Service plan to log one of the unlogged, unroaded watersheds in the Crowsnest Pass to increase water delivery. We need more forest canopy, not less, given the recurring themes of heavy June rain storms and subsequent flooding. Fish do not immediately die from a logging operation but the legacy of poorly planned cutblocks, inappropriate roading and a lack of timely, effective restoration of the logging footprint creates a legacy of problems. These inevitably lead to population fragmentation, spawning failure, habitat loss and population declines. Once fish and wildlife populations dip below a critical mass, any of a number of factors, natural and/or human, are magnified and cause populations to disappear. The cutblocks on Hidden Creek won’t be logged again for over 100 years based on slow, torturous growth rates in a circumstance where trees struggle. The ones cut were over 100 years old and barely eight inches in diameter at their bases. When those trees were seedlings, about 1900, far-sighted and wise bureaucrats were thinking about and instituting a landscape approach to watershed protection called the Forest Reserve. Sadly, that noble ideal has been exchanged for one of exploitation, a shift for areas originally set aside for their watershed virtues. Maybe, just maybe, by the time the feller bunchers or their new kin come again to Hidden Creek there will be a more enlightened approach to forest and watershed management than that exhibited by recent logging. If bull trout and cutthroat trout (as well as grizzlies, elk, wolverine and lynx) survive this latest logging onslaught they might persist until the next one. The best we can hope for, those of us that appreciate clean water, native trout and watersheds with ecological integrity, is the Forest Service goes extinct before many of the indicators of enlightened, sustainable forest management do. 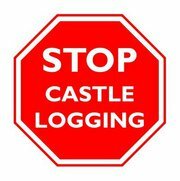 You are currently browsing the Stop Castle Logging blog archives for September, 2013.